Ideal vaccines should be stable, safe, molecularly defined, and out-of-shelf reagents efficient at triggering effector and memory Ag-specific T cell-based immune responses. Dendritic cell-derived exosomes could be considered as novel peptide-based vaccines because exosomes harbor a discrete set of proteins, bear functional MHC class I and II molecules that can be loaded with synthetic peptides of choice, and are stable reagents that were safely used in pioneering phase I studies. However, we showed in part I that exosomes are efficient to promote primary MHC class I-restricted effector CD8+ T cell responses only when transferred onto mature DC in vivo. In this work, we bring evidence that among the clinically available reagents, Toll-like receptor 3 and 9 ligands are elective adjuvants capable of triggering efficient MHC-restricted CD8+ T cell responses when combined to exosomes. Exosome immunogenicity across species allowed to verify the efficacy of good manufactory procedures-manufactured human exosomes admixed with CpG oligonucleotides in prophylactic and therapeutic settings of melanoma in HLA-A2 transgenic mice. CpG adjuvants appear to be ideal adjuvants for exosome-based cancer vaccines. Spinning molecular immunology into successful immunotherapy to amplify immune responses and break Ag-specific tolerance has been and remains an important challenge to date. The rational design of vaccines initially involves identification of the immune effector mechanisms responsible for protection against disease (cellular immune responses for cancer) and the subsequent selection of an Ag capable of eliciting the desired adaptive response. A productive immune response is defined by the generation of clonally expanded Ag-specific T (or B) cells, requiring effective Ag presentation to specific TCR on naive T cells (or membrane-bound Ig on B cells). In some cases, in addition to this signal 1, a delivery signal 2 of costimulatory molecules or cytokines is provided by APCs and requested for the priming of CD4+ T cells, helper arms of CTL effectors (or Ag-specific B cells) (1, 2, 3). Adjuvants (adjuvare is Latin for “to help”) serve as critical components in the design of effective, nonreplicating vaccines to enhance or boost immunogenicity of coadministered Ags (4). Molecular definition of adjuvants has been surrounded by obscurity and called the “immunologist’s dirty little secret” by Janeway (6) in 1989 (2, 5, 6). Attempts have been made to classify adjuvants functionally according to at least five concepts of immunogenicity: first, the geographical concept of immune reactivity (1), and second, the theory of depot effect (7), both emphasizing the importance of Ag localization for a period of time after immunization; third, the paradigm that adjuvants act as signal 0, i.e., trigger signaling of pattern recognition receptors and activation of innate immune cells to release cytokines/chemokines (8, 9); fourth, the hypothesis that adjuvants induce or act as danger molecules (stressed or damaged tissues alerting APCs to up-regulate costimulatory molecules) (10, 11); and finally, the role of signal 2 through cytokines and costimulation as natural adjuvants (6, 12, 13). Dendritic cells (DC) 4 are likely to play a central role as nature’s adjuvants because of their unique ability to turn on naive T cells at a mature stage of differentiation (14, 15). The maturation or activation of DC occurs in response to a broad array of signals, either pathogen-associated molecular pattern molecules (through Toll-like receptors (TLRs)), or endogenously produced signals of the TNF family members (through TNFR or CD40 ligand) (16, 17, 18, 19). Upon maturation, they become capable of activating innate effector cells (NKT and NK cells) (20, 21), and move from the periphery to the draining lymph nodes (LN) via afferent lymphatics (22). Immunostimulation by adjuvants may result from increased attraction of DC toward the injection site (23), increased loading (or cross-presentation of exogenous Ag by MHC class I molecules) of APCs (24), or increased transport of Ag-loaded APCs toward the LN (25, 26). Hence, DC represent ideal targets for vaccine adjuvants, and cytokine-DC interactions are indispensable for linking innate and cognate immunity (27). We described exosomes as membrane vesicles originating from DC late endosomes and secreted constitutively in vitro upon fusion of multivesicular membrane with plasma membrane (28, 29). In the first part (58), we brought evidence that: 1) DC produce exosome-associated MHC class I complexes that are functional for CTL priming; 2) exosomes require mature DC (mDC) for T cell activation in vitro and in vivo; and 3) exosomes exhibit comparable efficacy as mDC to initiate synthetic peptide-specific CD8+ T cell responses in vivo. Therefore, the design of an efficient exosome-based cancer vaccine requires an adjuvant that should mimick or substitute for mDC in vivo. In this second part, we show that: 1) exosome-mediated CD8+ T cell priming can be triggered using CpG DNA oligomeric sequences (and dsRNA); 2) most of the clinically available alternative adjuvants that do not directly activate DC in vivo cannot boost exosome immunogenicity in HHD2 mouse model; 3) in the B16 melanoma tumor model coexpressing human HLA-A2 and gp100 tumor Ag, 1010 exosomal MHC class I molecules presenting gp100 peptides admixed with CpG oligonucleotides (ODN) mediate tumor rejection as efficiently as 3 × 105 mDC-A2/gp100 and more efficiently than high dosages of peptides stressing that exosomes are valuable cell-free peptide vaccines. Mouse bone marrow-derived DC (BM-DC) were cultured, as previously described (12). Briefly, bone marrow progenitor cells were grown in IMDM culture medium (Sigma-Aldrich, St. Quentin Fallavier, France) supplemented with 50 U/ml penicillin, 50 μg/ml streptomycin, 2 mM l-glutamine, 10% decomplemented FCS (Life Technologies, Paisley, U.K.), 50 μM 2-ME (Sigma-Aldrich), and 30% J558 murine GM-CSF culture supernatants for 10–12 days. At day 11, maturation of BM-DC was induced by adding LPS (5 μg/ml; Sigma-Aldrich) to culture medium for 24 h. For in vivo immunization protocols, BM-DC were used at day 12. The phenotype of BM-DC was analyzed by flow cytometry using anti-mouse CD11c, I-Ab, CD80, CD86, and CD40 mAb (BD PharMingen, Heidelberg, Germany), and H-2Kb and H-2Db (22). In addition, BM-DC propagated from HHD2 mice were stained with MA2.1 Ab-containing ascitis. Exosomes were either isolated using the classical process of a series of differential ultracentrifugation already described (11, 12) or isolated according to a process of ultrafiltration/diafiltration derived from Lamparsky et al. (30). Briefly, 2–4 L of DC culture medium was microfiltrated (3 μm/0.8 μm) and then ultrafiltered through a 500-kDa filter up to a final volume of 50 ml. This 50 ml of exosome-containing medium was supplemented with up to 1 L of PBS, and a second step of 500-kDa ultrafiltration was performed, leading to a final volume of 20–50 ml. This preparation was ultracentrifuged at 100,000 × g onto a D20/30% sucrose gradient-density cushion (d = 1.217). The exosomal pellet recovered in the cushion was diafiltrated for sterilization and will be referred to as exosomes henceforth. 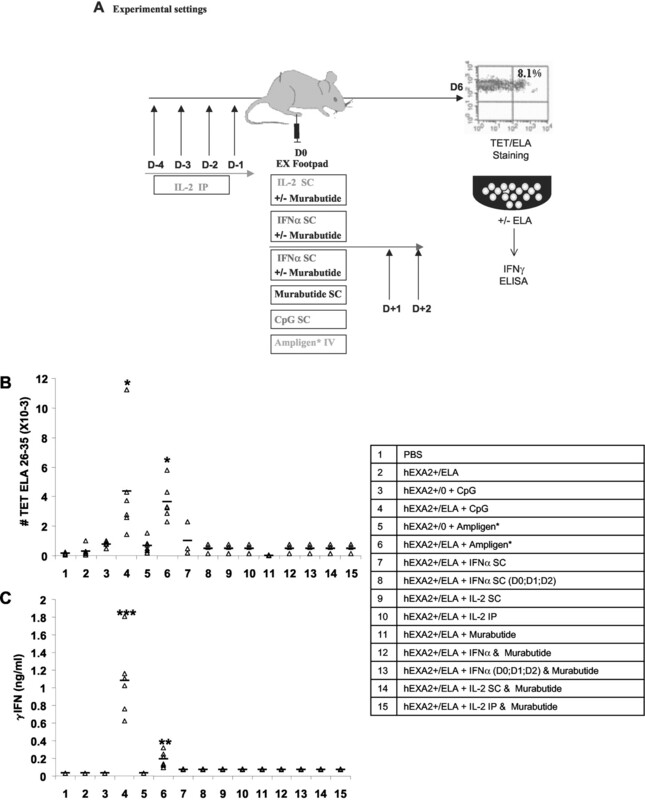 A titrated mouse anti-human MHC class I mAb (HLA-A, B, C; BD PharMingen) was incubated with excess exosomes that had dried in a 96-well plate and subsequently blocked with 6% nonfat milk. After a 1-h incubation, the plate was washed and incubated with addition of excess goat anti-mouse Ab (Jackson ImmunoResearch Laboratories, West Grove, PA) conjugated to HRP for 1 h at room temperature. The plate was developed for 5 min using the ECL substrate system, as described by the manufacturer (Amersham Pharmacia, Saclay, France). Chemiluminescence signal was measured by the Wallac trilux chemiluminometer (PerkinElmer, Gaithersburg, MA). To elute the endogenous MHC class I peptides bound to exosomes, 100 μl of exosomes (∼1012 MHC class I molecules) is treated with an equal volume of acetate buffer, pH 5.1, containing the synthetic CTL epitope MelanA/Mart1(ELAGIGILTV) at 10 μM at 4°C for 30 min (ExMart1). After such an acidification, the preparation is neutralized with a Tris buffer, pH 11, on ice for 15 min to allow reformation of the trimolecular MHC class I/peptide complexes. Then unbound peptides and debris are removed using an ultracentrifugation (100,000 × g/min, 40 min) step on a D2O/30% sucrose gradient-density cushion. The exosomes recovered in the cushion are subsequently ultracentrifuged (100,000 × g, 1 h). The pellet is resuspended in 1× PBS and stored at −80°C. Unbound peptides cannot exceed a final concentration of 1–7 nM. The process is similar for the loading of gp100 154–162(KTWGQYWQV) and gp100 209–217(IMDQVPFSV). Human Db (HHD2) mice derived from a strain deficient for mouse β2-microglobulin and H-2Db molecules and transgenic for a chimeric MHC class I molecule, HLA-A0201/Db, linked to the human β2-microglobulin (24), were provided by F. Lemonnier (Pasteur Institute, Paris, France). Transgenic mice were immunized in the footpad with 50 μl of the vaccine. Different vaccine designs were used (DC-derived exosome (Ex) alone, Ex onto mDC, Ex in CpG, Ex in poly(I:C), mDC or immature DC (iDC)/peptides, CpG/peptides). Detailed experimental settings are described in figure legends. Briefly, mouse ExA2−/Mart1 (ExKb) or mouse ExA2+Mart1+/− exosomes were either inoculated directly intradermally or pulsed onto 3 × 105 H-2b mDC (DC(Kb)) or HHD2 mDC (DC(A2)). Immunocapture assays with an internal standard allowed monitoring of the numbers of MHC class I molecules/exosome batch. Each group of three to five animals was immunized in the footpad with 4 × 108, 2 × 109, or 1010 exosomal MHC class I molecules. Other vaccines consisted in direct injection of peptide-pulsed iDC or mDC HHD2 DC. A single dose of 3 × 105 DC was loaded with increasing concentrations (from 0.01 to 10 μM) of MelanA/Mart126–35 (ELA) peptides. Alternatively, various amounts of ExA2+/− pulsed with Mart126–35 were mixed with endotoxin-free CpG oligomeric sequences (5′-TCC ATG ACG TTC CTG ACG TT-3′) (30 μg of CpG/mouse in a total volume of 50 μl for footpad inoculation) or associated to i.v. administration of poly(I):poly(C12U) dsRNA (Ampligen, 2.5 mg/ml; Bioclone, Republic of South Africa; provided by M. Adams, Velindre Hospital, Cardiff, U.K.); type I IFN, produced by M.F., as previously described (27, 30, 31); IL-2 (Proleukin, Chiron, France); murabutide derived from muramyl dipeptide kindly provided by G. Bahr, Laboratoire d’Immunologie Moléculaire de l’Infection et de l’Inflammation, Institut Pasteur de Lille and ISTAC Biotechnologie (Lille, France) (32), and Montanide (ISA 720; SEPPIC,;AQ: L, AQ: M Paris, France). Each experimental group contained three to five mice, and experiments were performed at least three times. Pooled data of the most representative experiments are shown on the graphs. Mice were immunized once on day 0, and popliteal and inguinal draining LN and controlateral nodes were harvested on day 5. LN mononuclear cells were first stained with A2/Mart1 or A2/HIVgag fluorescent (PE) soluble tetramers (0.2 μg) for 30 min at room temperature in 20 μl of 1× PBS/0.5% BSA (Sigma-Aldrich), then with anti-CD3 FITC mAb and anti-CD8 allophycocyanin mAb (BD PharMingen) for 30 min at room temperature before washing steps and analysis in a FACSCalibur (BD Biosciences, Heidelberg, Germany). We set up the significant values based on: 1) the staining achieved with an irrelevant tetramer (A2/HIVgag) on LN-draining relevant vaccination with exosomes A2/Mart1; 2) the staining achieved with the relevant tetramer (A2/Mart1) on controlateral or naive LN in control mice, as well as on LN-draining footpads inoculated with unpulsed exosomes. The mean ± SEM percentage of tetramer staining with A2/gag HIV on relevant nodes (n = 20) was 0.16 ± 0.13, representing absolute numbers of 437 ± 250 cells; the mean ± SEM percentage of tetramer staining with A2/Mart1 on naive nodes (n = 20) was 0.35 ± 0.3, representing absolute numbers of 1750 ± 970 cells; the mean ± SEM percentage of tetramer staining with A2/Mart1 on LN-draining vaccination with unpulsed exosomes (n = 20) was 0.54 ± 0.4, representing absolute numbers of 2383 ± 1063 cells. Therefore, we set up the cutoff value for significancy at 5000 ± 1000 cells. Function of LN-residing T cells following immunization was assessed by challenging LN mononuclear cells to grading doses of Mart1 peptides. Supernatants were collected at 48–72 h to evaluate IFN-γ, IL-4, and IL-10 levels in ELISA (BD PharMingen). B16F10 cotransfected with the human HLA-A2 and gp100-encoding cDNA was kindly provided by the Department of Tumor Immunology, University Hospital Nijmegen (G.A.). A total of 3 × 105 tumor cells was inoculated on day 0 in the right abdominal flank, and vaccine consisting of mature BM-DC or human HLA-A*0201 exosomes in CpG oligos (as precised above) at increasing dosage was administered twice on days 5 and 10 (V1 and V2) in the footpad, as mentioned in Fig. 4⇓ legend, or days 9 and 14, as mentioned in Figs. 5⇓ and 6⇓. Peptide pulsing onto exosomes or mature BM-DC was performed using two gp100 peptides (gp100 154–162(KTWGQYWQV) and gp100 209–217(IMDQVPFSV)) at 50 μg/ml. Tumor growth was monitored biweekly using a caliper. Absolute numbers of CD8+ T cells and IFN-γ levels have been analyzed using an ANOVA with Fisher’s exact method. Significances within 95, 99, and 99.9% confidence interval are depicted on the graphs with ∗, ∗∗, and ∗∗∗, respectively. Comparisons between groups were performed using the nonparametric Kruskal-Wallis test. We first showed that exosomal MHC class I molecules require transfer onto mDC to promote efficient CTL priming in vivo (58). To facilitate the clinical implementation of exosomes, we looked for a synthetic adjuvant that would trigger DC maturation in vivo. Synthetic ODN that contain unmethylated CG dinucleotides in particular sequence contexts (CpG motifs) mimic bacterial DNA (33) and have been shown to boost innate immune responses and promote acquired Th1-biased cellular and humoral immunity (34, 35). In mice, CpG ODN directly target myeloid and plasmacytoid DC and trigger their activation (36, 37, 38). Therefore, we first analyzed the ability of CpG ODN to enhance exosome-mediated Mart1-specific CTL responses in HHD2 mice. Because we demonstrated that efficient MHC class I-restricted Ag presentation could be achieved using exosomes pulsed onto mDC (58), we aimed at comparing efficacy of effector T lymphocytes secreting IFN-γ (Tc1) differentiation using CpG vs mDC for priming with exosomes. Immunization with exosomes pulsed with Mart126–35 epitopes was performed between 108 and 1010 MHC class I molecular ranges in the presence of mDC (HHD2) or CpG oligomeric sequences (Fig. 1⇓). As previously shown (58), exosomes loaded onto syngeneic mDC(A2) significantly expanded ELA-specific CTL (Fig. 1⇓A, p < 0.01) that differentiate into potent Tc1 (Fig. 1⇓B, p < 0.01) with a plateau reached at 2 × 109 MHC class I molecules (p > 0.05 between 2 × 109 ExA2+/ELA and 1 × 1010 ExA2+/ELA; Fig. 1⇓). Similar efficacy for both CTL expansion (5–7% tetramer-binding CD8+ T cells; Fig. 1⇓ inset) and Tc1 differentiation (Fig. 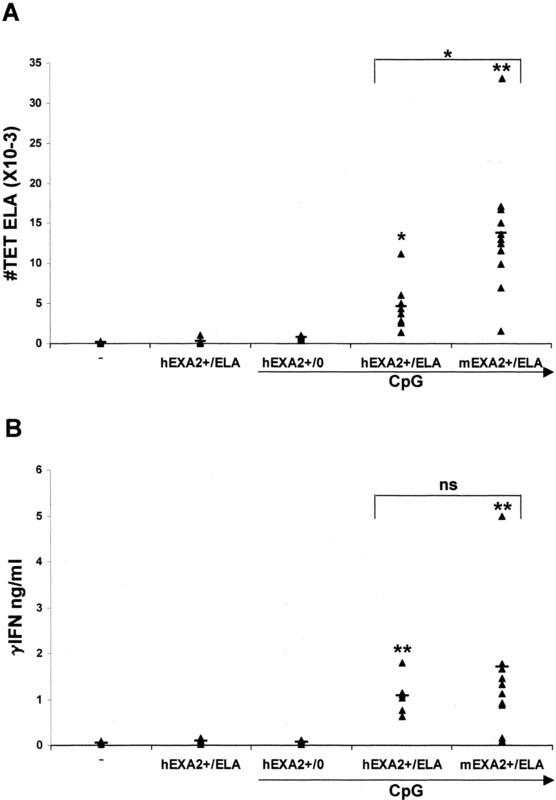 1⇓B) was achieved using ExA2+/ELA in CpG adjuvants with up to 1 × 1010 exosomal A2+/ELA molecules required for CTL responses (p < 0.05 compared with ExA2+/0; Fig. 1⇓A). In all cases, IFN-γ secretion by LN-residing CD8+ T cells was peptide dependent (data not shown). There were no statistically significant differences between mDC and CpG ODN at 1 × 1010 exosomal A2+/ELA molecules to trigger Tc1 differentiation (Fig. 1⇓, p > 0.05). Figure legend continues Comparative efficacy of various CpG-based peptide vaccines for CTL priming. A, HHD2 mice were immunized on day 0 in the footpad with autologous (EXA2+) or allogeneic exosomes (EXKb) pulsed with Mart126–35 peptides (/ELA) or not pulsed (/0) at a dosage of 107-1010 MHC class I molecules. They were either pulsed onto 3 × 105 autologous mature BM-DC (HHD2) or injected along with 30 μg of CpG ODN. Alternative vaccines consisted in the gold standard mDC (mDC + ELA peptides) pulsed with increasing dosages of Mart1 ELA peptides or ELA peptides in CpG adjuvants directly inoculated at increasing dosages intradermally. On day 5, mononuclear cells of the draining LN were examined for the staining with A2/Mart1 or A2/HIVgag soluble fluorescent tetramers. The absolute numbers (A) and percentage (inset of A) of tetramer-positive cells in the gated CD3+/CD8+ cells are shown. Each dot of A or dot-plot graph in the inset represents data obtained from one mouse. B, Shows Mart1-dependent IFN-γ secretion of LN mononuclear cells challenged with 10 μM of Mart1 peptides in 48-h in vitro cultures. Each dot represents data obtained from one mouse. This figure gathers the data obtained in five independent experiments (mDC + ELA and EX + mDC have been shown in Fig. 6⇓ of Ref.58 ). ∗, Indicates statistically significant differences at 0.05 confidence interval (and ∗∗ at 0.01) using Fisher’s exact method. ns, Not significant at 5% confidence interval. The capacity of exosomes to prime CD8+ naive T cells was compared with that mediated by peptide alone, both in conjunction with CpG ODN. Bioactivity of CpG sequences was checked in vitro on iDCs. A total of 10–30 μg of CpG sequences triggered BM-DC maturation (data not shown), in contrast to mock sequences. Footpad immunization using free Mart126–35 peptides in the presence of CpG sequences was analyzed at grading ranges (0.01–20 μM) of peptides. Even at high peptide dosage, vaccination with Mart1 peptides adjuvantized in CpG (30 μg) weakly primed Mart1-specific CTL (p > 0.05; Fig. 1⇑). It is noteworthy that while up to 20 μM of ELA peptides adjuvantized in CpG did not significantly promote Mart1-specific CTL expansion (Fig. 1⇑A), ExA2+/ELA adjuvantized in CpG did (ExA2+/ELA-associated −1010 MHC class I molecules, p < 0.01 compared with ExA2+/0; Fig. 1⇑A). Moreover, such ExA2+/ELA adjuvantized in CpG elicited Mart1-specific Tc1 cells more efficiently than 20 μM of ELA adjuvantized in CpG (p < 0.05 between 1 × 1010 ExA2+/ELA and 20 μM of ELA; Fig. 1⇑B). However, peptide stability following intradermal injection is known to be poor. Therefore, immunogenicity of 2 × 109-1010 exosomal ExA2+/ELA complexes in CpG ODN was compared with that mediated by 3 × 105 mDC(A2) pulsed with saturating concentrations of peptides in HHD2 mice. Indeed, in our model system, a plateau of Tc1 differentiation was achieved with mDC using ∼0.3–0.5 × 105/footpad injection (data not shown). The threshold for exosome efficacy in Tc1 priming was ∼2 × 109-1 × 1010 MHC class I molecules in CpG ODN. Importantly, there was no statistically significant difference between: 1) 1010 ExA2+/ELA in CpG ODN and mDC pulsed with 0.1–10 μM of Mart1 regarding the expansion of A2+Mart1+ tetramer-binding CD8+ T cells (p > 0.05; Fig. 1⇑A), and 2) 1010 ExA2+/ELA in CpG ODN and mDC pulsed with 1–10 μM of Mart1 regarding the priming of Mart1-specific Tc1 (p > 0.05; Fig. 1⇑B). CpG ODN could be considered appropriate adjuvants that enable Ex to be immunogenic vehicles of MHC class I/peptide complexes for the differentiation of Tc1 cells. Moreover, exosomes in CpG ODN could substitute for mDC in the initiation of synthetic peptide-specific primary CD8+ T cell responses. To test whether exosomes could be implemented in the setting of human cancer vaccines, we explored the capacity of human exosomes to mediate tumor rejection in mice. Therefore, we first address the cross-species bioactivity of exosomes by inoculating exosomes secreted from human HLA-A*0201 monocyte-derived DC in HHD2 mice. As shown in Fig. 2⇓, human HLA-A*0201 exosomes pulsed with Mart1 peptides can elicit mouse CTL priming in HHD2 mice with significant expansion of CD8+ T cells binding the A2/Mart1 tetramers (Fig. 2⇓A) and secreting ng levels of IFN-γ after short ex vivo stimulation with Mart1 peptides (Fig. 2⇓B). Like mouse HHD2 exosomes, human HLA-A*0201 exosomes (at 1010 ExA2+/ELA molecules) required synthetic adjuvants, i.e., bacterial DNA sequences (CpG) to efficiently prime CTLs. These data suggest that: 1) preclinical studies in mice can be performed using GMP human exosomes, and 2) a conserved molecular pattern of APC recognition by exosomes might be involved and activated by CpG ODN. Cross species immunogenicity of exosomes administered along with synthetic adjuvants. Exosomes secreted from HLA-A*0201 normal volunteers’ monocyte-derived DC (hEXA2+) were inoculated in the footpad of HHD2 mice, after pulsing with Mart1 peptides and compared with mouse HHD2 exosomes. The highest dosage of 1010 exosomal MHC class I molecules was administered alone or with 30 μg of CpG ODN. −, Represents naive LN. A, Depicts absolute numbers of CD3+/CD8+ lymphocytes of the draining LN staining with A2/Mart1-specific tetramers, while B shows Mart1-dependent IFN-γ secretion of LN mononuclear cells challenged with 10 μM of Mart1 peptides in 48-h in vitro cultures. Each dot represents data obtained from one mouse. Each panel depicts the data relevant for two independent experiments. ∗, Indicates statistically significant differences at 0.05 confidence interval (∗∗ at 0.01, and ∗∗∗ at 0.001) using Fisher’s exact method. We tested clinically available adjuvants in conjunction with Ex (experimental designs listed in Fig. 3⇓A). Some cytokines are known to be natural adjuvants (27). Montoya et al. (39) reported that murine DC secrete and respond to type I IFNs, identifying these cytokines as autocrine DC activators for the priming of naive T cells. Because these results obtained in mouse models are consistent with data obtained with human DC (30) and because type I IFNs are indispensable for the action of Th1-promoting adjuvants (31), we first combined type I IFN (1–3 injections on a daily basis; Fig. 3⇓A; 100,000 IU each injection) in the footpad along with exosomal 1010 ExA2+/ELA complexes. In both settings, type I IFNs could not promote exosome-mediated Tc1 expansion or differentiation in HHD2 (Fig. 3⇓, B and C). However, a significant recruitment of both plasmacytoid DC and B cells was achieved in draining LN on day 5 (data not shown) following inoculation of exosomes and type I IFNs. CpG ODN and dsRNA are efficient adjuvants inducing exosome immunogenicity in vivo. A, Experimental settings. Exosomes were injected in the footpad on day 0 (D0) admixed with various adjuvants: 250 μg of double-stranded poly(I):poly(C12U) RNA injected i.v. at D0, 30 μg of CpG coinjected in the footpad at D0, 100,000 IU of IL-2 +/− 10 mg/kg murabutide admixed with exosomes at D0, 100,000 IU of IFN-α+/− 10 mg/kg murabutide admixed with exosomes at D0, 10 mg/kg murabutide admixed with exosomes at D0, 100,000 IU of IL-2 i.p. twice daily (D-4 to D-1) ± 10 mg/kg murabutide admixed with exosomes at D0, and 100,000 IU of IFN-α in the footpad (D0 to D2) ± 10 mg/kg murabutide admixed with exosomes at D0. B, Depicts absolute numbers of CD3+/CD8+ lymphocytes of the draining LN staining with A2/Mart1-specific tetramers, while C shows Mart1-dependent IFN-γ secretion of LN mononuclear cells challenged with 10 μM of Mart1 peptides in 48-h in vitro cultures. Each dot represents data obtained from one mouse. Each panel depicts the data relevant for three independent experiments. ∗, Indicates statistically significant differences at 0.05 confidence interval (∗∗ at 0.01, and ∗∗∗ at 0.001) using Fisher’s exact method. ns, Not significant at 5% confidence interval. Secretion of IL-2 by mouse DC is important in conferring to these cells a T cell-priming capacity that is severely impaired in DC isolated from IL-2−/− knockout mice (40). Moreover, IL-2 has been shown to promote specific and nonspecific T cell responses in humans (41). However, neither IL-2 s.c. nor IL-2 i.p. (100,000 IU each injection; Fig. 3⇑A) could significantly induce exosome-mediated Tc1 differentiation in HHD2 (Fig. 3⇑, B and C). Murabutide is a safe (apyrogenic) synthetic immunomodulator derived from muramyl dipeptide, the minimal bioactive structure of the bacterial cell wall peptidoglycan (32). Murabutide has been shown to enhance nonspecific resistance to bacterial and viral infections (42). Murabutide has also been shown to synergize with cytokines such as IFN-α (43) and IL-2 (44). Because murabutide has been clinically evaluated and was found to modulate cytokine release without toxicity (45), we tested the association of exosomes along with murabutide (10 mg/kg) or the combination of murabutide and IFN-α or IL-2 (Fig. 3⇑A). As shown in Fig. 3⇑, B and C, none of these associations could promote significant expansion of Mart1-specific CD8+ T cells in draining LN. Montanide (46) was also tested with no adjuvant capacity along with exosomes (data not shown), but the stability of the mixture has to be evaluated in details. In contrast, the dsRNA poly(I):poly(C12U) that was injected i.v. at the dosage of 250 μg (Fig. 3⇑A), while the exosomes were inoculated at day 0 in the footpad, was efficient to promote both specific CTL expansion and Tc1 differentiation in HHD2, although to a lesser extent compared with CpG ODN (Fig. 3⇑, B and C). This component, supposed to act through TLR3 and to cause DC maturation (47), has been evaluated in chronic fatigue syndrome and cancer (48, 49). Altogether, mostly TLR3 and TLR9 ligands were significant inducers of CD8+ T cell priming along with Ex in vivo. Because human exosomes maintain their immunogenicity across species (at least in rodents), we investigated the capacity of human exosomes to reject establishment of day 6 nonpalpable B16F10 melanoma cotransfected with human HLA-A2 and gp100 cDNA. As expected, mouse HHD2 mature BM-DC pulsed with both gp100 peptides (gp100154–162 and gp100209–217) were potent antitumor vaccines with up to 60% tumor-free mice achieved with 3 × 105 mature cells at saturating doses of peptides (Fig. 4⇓A). It is noteworthy that above the therapeutic level of 3 × 105 mDC into the footpad, results were less impressive, presumably because of the limited area of vaccine inoculation. DC-mediated antitumor effects were peptide specific (Fig. 4⇓A). 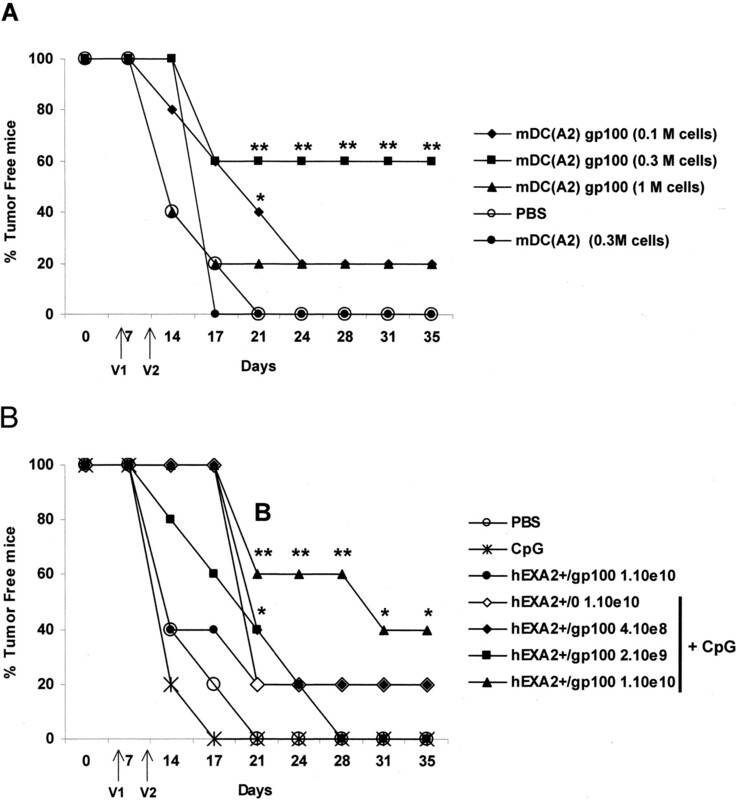 In a similar setting, HLA-A*0201 human exosomes pulsed with both gp100 peptides and admixed with CpG ODN were also efficient at preventing tumor growth with up to 40% tumor-free animals at the end of the experiments. Only the highest exosome dose level, i.e., 1010 exosomal MHC class I molecules pulsed with gp100, was consistently mediating significant antitumor effects, while 2 × 109 or 4 × 108 could not (Fig. 4⇓B). These antitumor effects were in part peptide specific because CpG with 1010 unpulsed exosomal MHC class I molecules could not significantly prevent tumor growth (Fig. 4⇓B). In such a setting, human exosomes did not bear the appropriate MHC class II molecules necessary to trigger CD4+ T cell help and long-lasting CD8+ memory T cell responses, in contrast to syngeneic mDC. Human exosomes harboring A2/gp100 complexes prevent establishment of B16A2/gp100 melanoma in HHD2 mice. A, B16F10 tumors coexpressing human HLA-A2 and gp100 were treated on day 6 (V1, not palpable) and day 10 (V2, palpable in controls) using footpad immunization with increasing dosages of mDC (HHD2) pulsed with gp100 or 3 × 105 unpulsed mDC as a negative control. B, Identical therapeutic setting using increasing dosages of human exosomal MHC class I molecules pulsed with gp100 peptides (hEXA2+/gp100) in 30 μg of CpG ODN or CpG alone or in conjunction with unpulsed 1010 exosomal MHC class I molecules (hEXA2+/0). The graph depicts effective tumor eradication with time. This experiment included five mice/group and has been performed twice with identical conclusions. Statistical analyses were performed using Fisher’s exact method, and ∗ indicates statistically significant differences at 0.05 confidence interval (and ∗∗ at 0.01) vs PBS groups (A) and vs PBS groups and PBS + CpG groups (B). Another set of tumor experiments was performed to prevent the growth of large s.c. tumors at the time of vaccine inoculation using various peptide-based vaccine designs (mDC, exosomes, free peptides). Fig. 5⇓ depicts the efficacy of 3 × 105 mature HHD2 DC pulsed with gp100 to abrogate spontaneous tumor growth in a peptide-specific manner. Although CpG ODN display no significant antitumor effects, the association of CpG ODN and exosomes (at 1010 ExA2+/ELA) mediates significant growth retardation in HHD2 (p < 0.05; Fig. 5⇓). It is noteworthy that unpulsed exosomes do exhibit modest antitumor effects, albeit not significant (p > 0.05; Fig. 5⇓). As expected from data shown in Fig. 1⇑ comparing free peptides vs exosomes in CpG ODN, exosomes were more efficient than high dosages of free peptides in hampering tumor growth of pre-established tumors (Fig. 6⇓). Therapeutic efficacy of mDC and exosomes in CpG on established melanoma. B16F10 tumors coexpressing human HLA-A2 and gp100 were treated on day 10 (V1, palpable tumor in all mice) and day 15 (V2) using footpad immunization with mDC (HHD2) pulsed with gp100, 3 × 105 unpulsed mDC, PBS as a negative control, human exosomal MHC class I molecules pulsed with gp100 peptides (hEXA2+/gp100) in 30 μg of CpG ODN, or CpG alone or in conjunction with unpulsed 1010 exosomal MHC class I molecules (hEXA2+/0). The box plot depicts the mean tumor size at the end of the experiment (time of sacrifice is D31). This experiment included five mice/group and has been performed twice with identical conclusions. Statistical analyses were performed using Fisher’s exact method, and ∗ indicates statistically significant differences at 0.05 confidence interval (and ∗∗ at 0.01) vs PBS groups and vs PBS groups and PBS + CpG groups. ns, Not significant at 5% confidence interval. Comparative efficacy of exosomes vs peptides for tumor eradication. Similar setting as in Fig. 5⇑, but treatment groups consisted in CpG ODN alone or combined with increasing dosages of free synthetic peptides vs peptides pulsed onto increasing dosages of exosomal MHC classs I molecules. Clinical follow-up and statistical analyses were performed, as described above. Following our first report showing that Ex display abundant MHC class I/peptide complexes that require transfer onto mDC to become functionally active on specific TCRs (58), we adressed whether clinically available adjuvants causing DC maturation in vivo could substitute for ex vivo propagated mDC to allow exosome-mediated T cell priming in vivo. In this work, we show that TLR3 and TLR9 ligands appear to be the most effective components in mice and that CpG ODN could be suitable exosome adjuvants not only for inducing Ag-specific CTL priming, but also for antitumor effects. The TLR9 ligand, CpG ODN, appears to mirror part of the effects mediated by mDC when associated with exosomes. CpG ODN were reported to bring an infectious danger signal that acutely triggers innate nonself pattern recognition and to initiate immune responses (50). These responses are Th1 polarized (51, 52) and result in enhanced hemopoietic activity (53). Aseptic immunostimulation with CpG ODN induces in mice local lymphadenopathy associated with long-term local immune hypersensitivity, which promotes Tc1 CTL and Th1 responses to Ag and infection (52). CpG ODN predispose local draining LN to respond to Ags by dramatically augmenting the number of CD11c+ cells (20× at day 1; 300× at day 10) that produce IL-12 and possibly IFN-γ. These environmental queues lead to CTL activation, with concomitant up-regulation of IL-12Rβ2 and IFN-γ synthesis by T cells (52). CpG ODN activate in vivo peptide-presenting DC to trigger protective CTL antiviral responses (53). Up-regulation of MHC class II, CD40, CD80, and CD86 on DC cell surface was monitored in the draining LN of footpads injected with peptides admixed with CpG-ODN 1668 ∼12–24 h after inoculation. Activation of Ag-presenting iDC can be brought up by CD40 ligand+ Th cells or by direct DC recognition of pathogen-derived ligands. Vabulas et al. (54) showed that CpG ODN allowed induction of Th cell-independent CTL responses toward MHC class I-restricted T cell epitopes. More recently, plasmacytoid DC have been identified as the primary targets of CpG ODN (36, 54, 55). However, the precise cellular target for exosomes resulting in the efficient presentation of MHC class I/peptide complexes to CTL in vivo is not yet known and is currently under investigation. Despite their profound local effect in draining LN for the development of Ag-specific Tc1 differentiation, CpG ODN in association with irradiated tumor cells could not protect mice against subsequent tumor challenge. However, peritumoral CpG ODN elicited a coordinated response of CD8+ T cells and innate effectors leading to long-term, tumor-specific protection (56). In this study, we show that exosomes in association with CpG ODN, both injected at a distant site from inoculated tumors, induce significant antitumor effects in vivo in the aggressive B16F10 melanoma model. One could hypothesize that exosomes most likely target APC such as DC in vivo and that CpG are critical to promote endogenous APC activation. Hence, stimulation with anti-CD40-stimulating Ab could also promote exosome-mediated antitumor effects (C. Masurier, unpublished observations). Interestingly, dsRNA (Ampligen), which recognizes TLR3 expressed most specifically on DC (57), is also able to promote exosome-mediated Tc1 differentiation in vivo. Activation of TLR3 induces activation of NF-κB and the production of type I IFN and inflammatory cytokines (TNF-α, IL-6, IL-12) (47). Interestingly, poly(I:C) and CpG ODN used as adjuvants induce high serum levels of type I IFN, and endogenous type I IFN is necessary for the Th1 type of immune response induced by these adjuvants in mice (31). Hence, type I IFN has been used as direct adjuvant combined with Ags or viral vaccines and was potent at inducing IgG2a and IgA Abs and protection from antigenic challenge (31). Locally produced or delivered type I IFN is expected to promote differentiation of monocytes into maturing DC producing IL-15 and expressing TRAIL, critical to elicit proliferation of certain T cell subsets and apoptosis of virally infected or tumoral targets, respectively (30). However, exosomes in addition with prolonged and sustained delivery of type I IFN did not mediate Tc1 differentiation in draining LN while favoring the local recruitment of B and plasmacytoid DC (data not shown). TRAIL expressing DC are also more susceptible to apoptosis in vitro, most likely causing the short-term exposure of exosomes on the DC surface in LN. It is interesting to note that our data support a better priming and therapeutic efficacy achieved using exosomes compared with free peptides in vivo (Figs. 1⇑ and 6⇑). This result could be accounted for by the better stability of exosomes in the dermo-epidermis and/or by the selective exosome targeting of APC capable of promoting efficient CTL responses and/or by additional intermediate effectors stimulated by exosomes that would facilitate CTL activation. Such assumptions require further investigations. Our data provide a rationale for the use of TLR3 or TLR9 ligands as adjuvants for the implementation of Ex in the armamentarium of cancer vaccines. Two exosome-based phase I clinical trials are being conducted currently using Mage3.A1/B35 and Mage3.DP04 peptides in nonsmall cell lung and melanoma-bearing patients in the absence of other adjuvants than MHC class II tumor epitopes. Preliminary data indicated that no CTL responses could be detected in circulating blood of cancer patients immunized with exosomes (our unpublished data), although some objective clinical responses will be reported. The demonstration that Ex are valuable vectors of MHC/peptide complexes in humans is still awaiting, but our data encourage to launch a second phase I/II clinical trial combining exosomes with efficient adjuvants. We thank Dee wei Hsu for providing some materials and methods for exosomal GMP production, and S. Amigorena, G. Raposo, and C. Théry for critical review of the manuscript and fruitful discussions. We are indebted to Dominique Gambaud, Annick Duval, and Christian Loy from Etablissment Français du Sang Nord de France for assistance with the apheresis, and to P. Ardouin and its animal facility for mice handling. ↵1 This work was supported by the European Community Grant QLRT-2001-00093, the LIGUE française contre le Cancer (Labelisation), the Association pour la Recherche sur le Cancer, the Ministry of Luxembourg (to N.E.C.S. ), and the PHRC 2002. N.C., F.A., and N.E.C.S. were supported by a European fellowship in the QLRT-2001-00093, a young investigator award from American Society of Clinical Oncology, and the Ministère de la Culture, de l’Enseignement supérieur et de la Recherche du Luxembourg/Fondation Luxembourgeoise contre le Cancer, respectively. ↵2 N.C., N.E.C.S., E.A., and L.Z. contributed equally to this study. ↵4 Abbreviations used in this paper: DC, dendritic cell; BM-DC, bone marrow-derived DC; Ex, DC-derived exosome; iDC, immature DC; LN, lymph node; mDC, mature DC; ODN, oligonucleotide; TLR, Toll-like receptor; Tc1, effector T lymphocytes secreting INF-γ. Zinkernagel, R. M., S. Ehl, P. Aichele, S. Oehen, T. Kundig, H. Hengartner. 1997. Antigen localization regulates immune responses in a dose- and time-dependent fashion: a geographical view of immune reactivity. Immunol. Rev. 156:199. Janeway, C. A., Jr. 1992. The immune system evolved to discriminate infectious nonself from noninfectious self. Immunol. Today 13:11. Gupta, R. K., E. H. Relyveld, E. B. Lindblad, B. Bizzini, S. Ben-Efraim, C. K. Gupta. 1993. Adjuvants: a balance between toxicity and adjuvanticity. Vaccine 11:293. Freund, J.. 1956. The mode of action of immunologic adjuvants. Adv. Tuberc. Res. 7:130. Janeway, C. A., Jr. 1989. Approaching the asymptote? Evolution and revolution in immunology. Cold Spring Harbor Symp. Quant. Biol. 54:1. Lascelles, A. K., G. Eagleson, K. J. Beh, D. L. Watson. 1989. Significance of Freund’s adjuvant/antigen injection granuloma in the maintenance of serum antibody response. Vet. Immunol. Immunopathol. 22:15. Janeway, C. A.. 1989. Immunogenicity signals 1, 2, 3, and 0. Immunol. Today 10:283. Janeway, C. A., Jr, C. C. Goodnow, R. Medzhitov. 1996. Danger: pathogen on the premises! Immunological tolerance. Curr. Biol. 6:519. Pennisi, E.. 1996. Teetering on the brink of danger. Science 271:1665. Kim, J. J., M. L. Bagarazzi, N. Trivedi, Y. Hu, K. Kazahaya, D. M. Wilson, R. Ciccarelli, M. A. Chattergoon, K. Dang, S. Mahalingam, et al 1997. Engineering of in vivo immune responses to DNA immunization via codelivery of costimulatory molecule genes. Nat. Biotechnol. 15:641. Steinman, R. M.. 1991. The dendritic cell system and its role in immunogenicity. Annu. Rev. Immunol. 9:271. Akira, S., K. Takeda, T. Kaisho. 2001. Toll-like receptors: critical proteins linking innate and acquired immunity. Nat. Immun. 2:675. Sallusto, F., A. Lanzavecchia. 1994. Efficient presentation of soluble antigen by cultured human dendritic cells is maintained by granulocyte/macrophage colony-stimulating factor plus interleukin 4 and down-regulated by tumor necrosis factor α. J. Exp. Med. 179:1109. Steinman, R. M., J. Metlay, N. Bhardwaj, P. Freudenthal, E. Langhoff, M. Crowly, L. Lau, M. Witmer-Pack, J. W. Young, E. Pure, et al 1998. Dendritic cells: nature’s adjuvant. C. A. Janeway, Jr, and E. E. Sercarz, Jr, and J. Sprent, Jr, eds. Immunogenicity 155.-165. Alan R. Liss/John Wiley, New York. McWilliam, A. S., S. Napoli, A. M. Marsh, F. L. Pemper, D. J. Nelson, C. L. Pimm, P. A. Stumbles, T. N. Wells, P. G. Holt. 1996. Dendritic cells are recruited into the airway epithelium during the inflammatory response to a broad spectrum of stimuli. J. Exp. Med. 184:2429. Dupuis, M., T. J. Murphy, D. Higgins, M. Ugozzoli, G. van Nest, G. Ott, D. M. McDonald. 1998. Dendritic cells internalize vaccine adjuvant after intramuscular injection. Cell. Immunol. 186:18. Rizza, P., M. Ferrantini, I. Capone, F. Belardelli. 2002. Cytokines as natural adjuvants for vaccines: where are we now?. Trends Immunol. 23:381. Lamparsky, H., A. Metha-Damani, J. Yao, S. Patel, D. Hsu, C. Ruegg, J. B. Le Pecq. 2002. 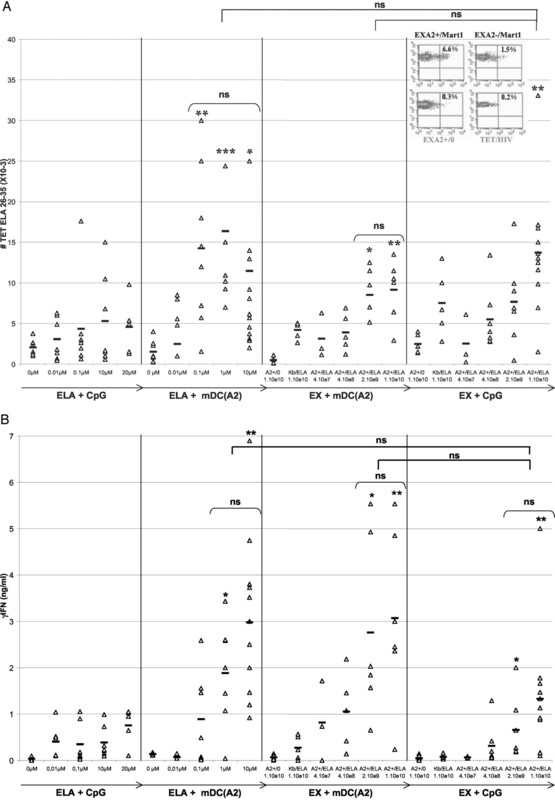 Production and characterization of clinical grade exosomes derived from dendritic cells. J. Immunol. Methods 270:211. Proietti, E., L. Bracci, S. Puzelli, T. Di Pucchio, P. Sestili, E. De Vincenzi, M. Venditti, I. Capone, I. Seif, E. De Maeyer, et al 2002. Type I IFN as a natural adjuvant for a protective immune response: lessons from the influenza vaccine model. J. Immunol. 169:375. Chedid, L. A., M. A. Parant, F. M. Audibert, G. J. Riveau, F. J. Parant, E. Lederer, J. P. Choay, P. L. Lefrancier. 1982. Biological activity of a new synthetic muramyl peptide adjuvant devoid of pyrogenicity. Infect. Immun. 35:417. Krieg, A. M., H. Wagner. 2000. Causing a commotion in the blood: immunotherapy progresses from bacteria to bacterial DNA. Immunol. Today 21:521. Krieg, A. M., G. Hartmann, A. K. Yi. 2000. Mechanism of action of CpG DNA. Curr. Top. Microbiol. Immunol. 247:1. Bauer, M., V. Redecke, J. W. Ellwart, B. Scherer, J. P. Kremer, H. Wagner, G. B. Lipford. 2001. Bacterial CpG-DNA triggers activation and maturation of human CD11c−, CD123+ dendritic cells. J. Immunol. 166:5000. Sparwasser, T., E. S. Koch, R. M. Vabulas, K. Heeg, G. B. Lipford, J. W. Ellwart, H. Wagner. 1998. Bacterial DNA and immunostimulatory CpG oligonucleotides trigger maturation and activation of murine dendritic cells. Eur. J. Immunol. 28:2045. Hacker, H., R. M. Vabulas, O. Takeuchi, K. Hoshino, S. Akira, H. Wagner. 2000. Immune cell activation by bacterial CpG-DNA through myeloid differentiation marker 88 and tumor necrosis factor receptor-associated factor (TRAF)6. J. Exp. Med. 192:595. Granucci, F., D. M. Andrews, M. A. Degli-Esposti, P. Ricciardi-Castagnoli. 2002. IL-2 mediates adjuvant effect of dendritic cells. Trends Immunol. 23:169. Li, D., B. Ronson, M. Guo, S. Liu, J. S. Bishop, D. A. Van Echo, B. W. O’Malley, Jr. 2002. Interleukin 2 gene transfer prevents NKG2D suppression and enhances antitumor efficacy in combination with cisplatin for head and neck squamous cell cancer. Cancer Res. 62:4023. Bahr, G. M., P. R. Pouillart, L. A. Chedid. 1996. Enhancement in vivo of the antiinflammatory and antitumor activities of type I interferon by association with the synthetic immunomodulator murabutide. J. Interferon Cytokine Res. 16:297. Pouillart, P. R., F. M. Audibert, L. A. Chedid, P. L. Lefrancier, G. M. Bahr. 1996. Enhancement by muramyl peptides of the protective response of interferon-α/β against encephalomyocarditis virus infection. Int. J. Immunopharmacol. 18:183. Bahr, G. M., E. Darcissac, P. R. Pouillart, L. A. Chedid. 1996. 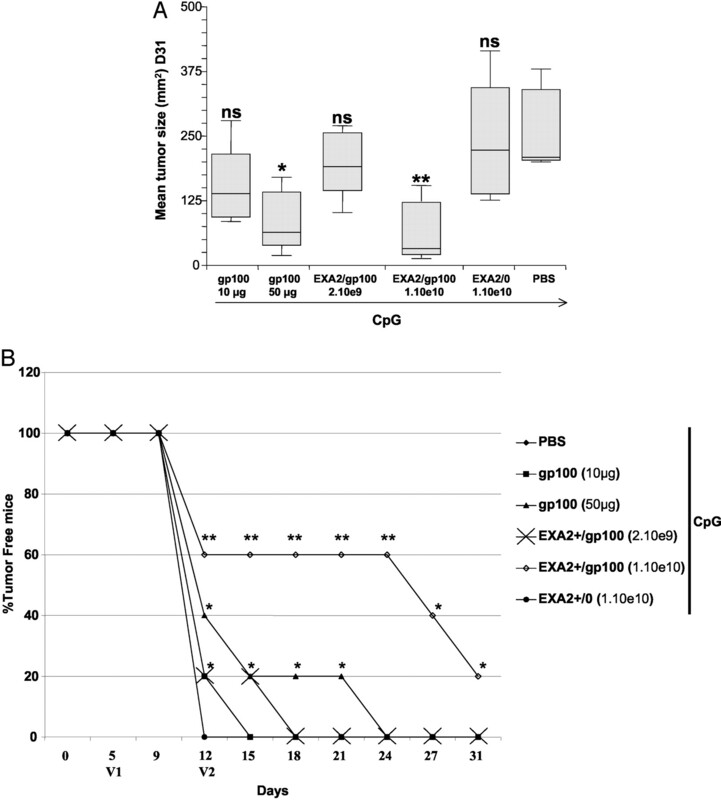 Synergistic effects between recombinant interleukin-2 and the synthetic immunomodulator murabutide: selective enhancement of cytokine release and potentiation of antitumor activity. J. Interferon Cytokine Res. 16:169. Bahr, G. M., E. Darcissac, D. Bevec, P. Dukor, L. Chedid. 1995. Immunopharmacological activities and clinical development of muramyl peptides with particular emphasis on murabutide. Int. J. Immunopharmacol. 17:117. Toledo, H., A. Baly, O. Castro, S. Resik, J. Laferte, F. Rolo, L. Navea, L. Lobaina, O. Cruz, J. Miguez, et al 2001. A phase I clinical trial of a multi-epitope polypeptide TAB 9 combined with Montanide ISA 720 adjuvant in non-HIV-1 infected human volunteers. Vaccine 19:4328. Adams, M., H. Navabi, B. Jasani, S. Man, A. Fiander, A. S. Evans, C. Donninger, M. Mason. 2003. Dendritic cell (DC) based therapy for cervical cancer: use of DC pulsed with tumor lysate and matured with a novel synthetic clinically non-toxic double stranded RNA analogue poly [I]:poly [C(12)U] (Ampligen(R)). Vaccine 21:787. Suhadolnik, R. J., N. L. Reichenbach, P. Hitzges, M. E. Adelson, D. L. Peterson, P. Cheney, P. Salvato, C. Thompson, M. Loveless, W. E. Muller, et al 1994. Changes in the 2–5A synthetase/RNase L antiviral pathway in a controlled clinical trial with poly(I)-poly(C12U) in chronic fatigue syndrome. In Vivo 8:599. Wagner, H.. 1999. Bacterial CpG DNA activates immune cells to signal infectious danger. Adv. Immunol. 73:329. Chu, R. S., O. S. Targoni, A. M. Krieg, P. V. Lehmann, C. V. Harding. 1997. CpG oligodeoxynucleotides act as adjuvants that switch on T helper 1 (Th1) immunity. J. Exp. Med. 186:1623. Lipford, G. B., T. Sparwasser, S. Zimmermann, K. Heeg, H. Wagner. 2000. CpG-DNA-mediated transient lymphadenopathy is associated with a state of Th1 predisposition to antigen-driven responses. J. Immunol. 165:1228. Sparwasser, T., L. Hultner, E. S. Koch, A. Luz, G. B. Lipford, H. Wagner. 1999. Immunostimulatory CpG-oligodeoxynucleotides cause extramedullary murine hemopoiesis. J. Immunol. 162:2368. Vabulas, R. M., H. Pircher, G. B. Lipford, H. Hacker, H. Wagner. 2000. CpG-DNA activates in vivo T cell epitope presenting dendritic cells to trigger protective antiviral cytotoxic T cell responses. J. Immunol. 164:2372. Kadowaki, N., S. Antonenko, Y. J. Liu. 2001. Distinct CpG DNA and polyinosinic-polycytidylic acid double-stranded RNA, respectively, stimulate CD11c− type 2 dendritic cell precursors and CD11c+ dendritic cells to produce type I IFN. J. Immunol. 166:2291. Heckelsmiller, K., K. Rall, S. Beck, A. Schlamp, J. Seiderer, B. Jahrsdorfer, A. Krug, S. Rothenfusser, S. Endres, G. Hartmann. 2002. Peritumoral CpG DNA elicits a coordinated response of CD8 T cells and innate effectors to cure established tumors in a murine colon carcinoma model. J. Immunol. 169:3892. André, F., N. Chaput, N. E. C. Schartz, C. Flament, N. Aubert, J. Bernard, F. Lemonnier, G. Raposo, B. Escudier, D.-H. Hsu, T. Tursz, S. Amigorena, E. Angevin, L. Zitvogel. Exosomes as potent cell free peptide-basedvaccine. I. Dendritic cell-derived exosomes transfer functional MHC class I/peptide complexes to DC. J. Immunol. 172:2126.